Jaume Padilla, PhD is a researcher in the Department of Nutrition and Exercise Physiology photographed in Gwynn Hall. Do you fidget while you sit? Jaume Padilla, assistant professor of nutrition at the University of Missouri, discusses whether this sometimes annoying activity can actually keep you healthier. 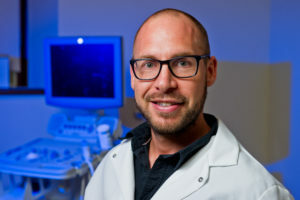 Jaume Padilla, Ph.D., serves as an assistant professor of nutrition and exercise physiology at the University of Missouri. Padilla’s research focuses primarily on understanding the physiological and molecular mechanisms by which physical inactivity and obesity-associated insulin resistance lead to impaired vascular function. Padilla earned a bachelor of arts in exercise sciences from the University of Lleida in Spain; a master of science in adapted physical activity from the University of Leuven in Belgium; and a doctorate in clinical exercise physiology from Indiana University. Padilla also completed a postdoctoral fellowship in vascular biology from the University of Missouri. As lead author of the study, “Prolonged Sitting-induced Leg Endothelial Dysfunction is Prevented by Fidgeting,” his work recently was published in the American Journal of Physiology Heart and Circulatory Physiology. We know that sitting for an extended period of time — such as at a computer or during a long airline flight — reduces blood flow to the legs, which may contribute to the development of cardiovascular disease. We all know someone who is a constant fidgeter, tapping his or her feet repeatedly throughout the day. My colleagues and I wanted to know if this constant fidgeting could prevent a decline in leg vascular function caused by prolonged sitting. While we expected fidgeting to increase blood flow to the lower limbs, we were quite surprised to find this would be sufficient to prevent a decline in arterial function. For the study, we compared the leg vascular function of 11 healthy young men and women before and after three hours of sitting. While sitting, the participants were asked to fidget one leg intermittently, tapping one foot for one minute and then resting it for four minutes, while the other leg remained still throughout. We found that on average, the participants moved their feet 250 times per minute. The measures of arterial function were performed in the popliteal artery, an artery in the lower leg. This is the first study to show that small amounts of leg movement during sitting can offset detrimental vascular effects of sitting. While only one leg was exposed to fidgeting during the experiment, in a real-world scenario we recommend tapping both legs to maximize the beneficial effects. However, it’s important to note that fidgeting isn’t a substitute for walking and exercise, which produce greater overall cardiovascular and metabolic benefits. You should attempt to break up sitting time as much as possible by standing or walking. But if you’re stuck in a situation in which walking just isn’t an option, fidgeting can be a good alternative.